August 6 is National Friendship Day and a great time to think about your very best friends, the wonderful pets that make up your extended family. With the heat of Summer upon us, here are some reminders to help keep your four-legged buddies safe and happy. Never, ever leave your dog in a hot car. We all love to take our pets with us, but on hot days, do what is best for them and leave them home. It only takes minutes for a pet to die in a car parked in the sun. Make sure your pet always has access to cool, drinking water. Think about getting your dog a small wading pool to keep cool and play in. If you go to the lake, ocean, or river, don’t assume your dog can swim well. Pet Life preservers are easy to find and inexpensive. Always check river currents before letting your dog play in the river. Pets can get sunburned too. This can be especially common if your pet has been shaved down for the summer or if your cat is sporting a lion cut. Check for sunscreens that are pet friendly. Do not assume human sunscreens are OK for your pets. This is the height of flea and tick season. Make sure you’ve visited your vet and that your pet is protected from all the parasites wanting to hitch a ride on them. Taking some simple steps and paying attention to what’s going on around your pet can help you avoid a tragedy. 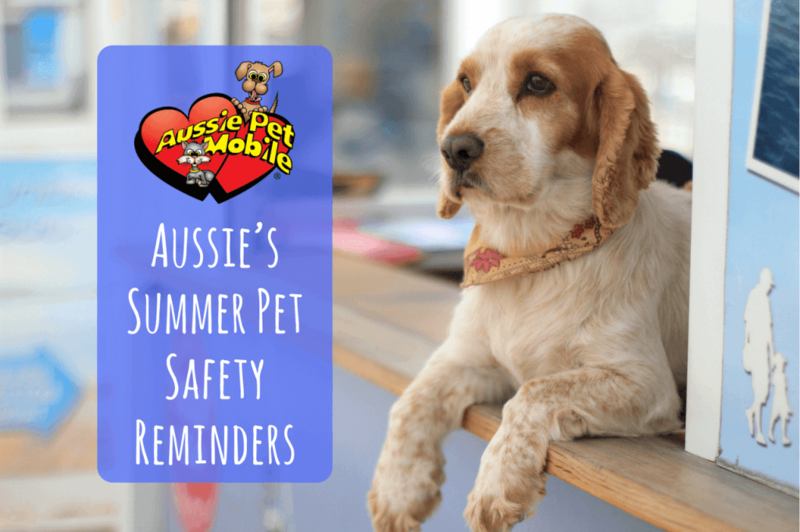 Another great way to maintain your pet’s health and the physical well-being is to get them regularly groomed with Aussie Pet Mobile throughout the summer months. Our de-shedding treatment is a great way to get rid of the bulky, excessive undercoat that traps heat next to their bodies and can hold in moisture and that not-so-nice wet dog smell. 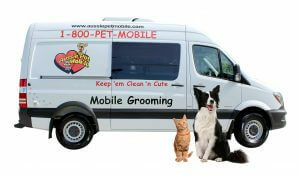 Call 1-800-PET-MOBILE today and book your appointment with your professional Aussie Pet Mobile groomer. Enjoy a great summer with your pets!